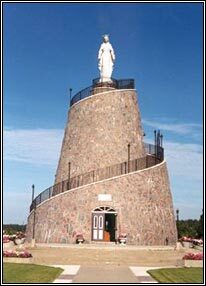 To establish a project of constructing a shrine of Our Lady of Lebanon duplicating that in Harissa, Lebanon. To keep alive the Lebanese tradition of devotion to Mother Mary. Collection of donations for the project from the Leamington Lebanese Community (as the main supporter), Venezuelan, Lebanese Community, Ottawa, Toronto, Detroit, Windsor and surrounding communities. Ground Breaking Ceremony ( beginning of the construction of the Shrine. Description of the statue: White Carrara marble; 145 feet high weighing 12 tons sitting on a conical base of concrete 42 feet in height and totaling just under 60 feet with a spiraling staircase to allow accessibility. Celebration to commemorate the Unveiling of the Statue and blessing by His Excellency the Bishop of Saint Maron Diocese of Canada, Bishop Elias Shaheen. Keeping alive the tradition of devotion to our Mother Mary with Annual Liturgical Celebration of Prayer and Feasting. Committed work of committed members of Our Lady of Lebanon Auxiliary of the Leamington Lebanese Club, Ontario, Canada. Building of the Stations of the Cross outside of the Shrine, motivated by the love they have for the Prayers related to these Stations. Blessing of the Stations of the Cross by His Excellency Mgr. Joseph Khoury during the Assumption Festival.